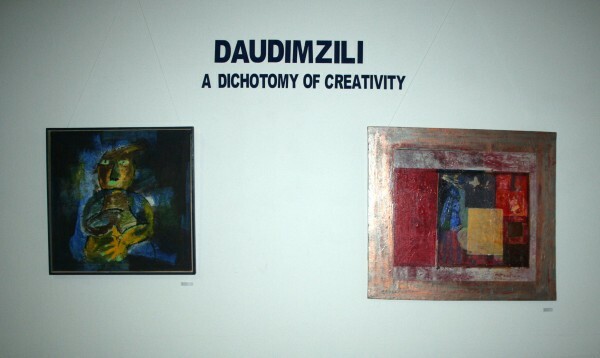 DaudiMzili Twin Exhibition: A Dichotomy of Creativity or Paradox of Mutual Confusion? Having attended the same university and only separated by a handful of years; having exhibited in nearly the same galleries and influenced by the same patronage system, this pair comes across as archetypal artistic bedfellows. They seem to have suckled from the same breast of contemporary art awareness and their styles are scarcely singular. Ladies and gentlemen, put your hands together for Daudi Karungi and Henry Mzili Mujunga, a pair that barely needs introduction, particularly among Uganda’s wacky art circles. They have struck again in their latest art collaboration, a thing that is more popular and indeed the “in-thing” for musicians. Under the theme Daudimzili: A Dichotomy of Creativity, the show depicts a contrast of two signature styles that are largely cast in the same mold of indigenous post-Modernism. 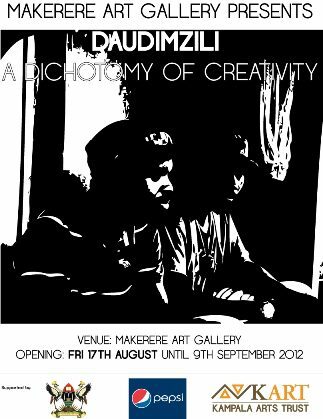 Visiting the exhibition running at the Makerere Art Gallery, a critical observer will be keen to decipher the ‘dichotomy of creativity’ as heralded by the duo. Is there a significant and decisive tinge of conflict, looking at the two styles juxtaposed? To what extent can we believe that Daudi and Mzili actually draw from diametrically opposite sources of inspiration? To understand these questions, we need to examine the context in which this show is held on the one hand and the content of the artworks of the exhibitors on the other. This year, 2012, marks the 75th anniversary of Margaret Trowell School of Industrial and Fine Arts (MTSIFA). On this occasion the gallery is launching a series of exhibitions, guest lectures, and workshops to celebrate the achievements and discuss the challenges and the future. The gallery organized the DAUDIMZILI exhibition as the first event in this context. This is very significant to note that the Makerere Art Gallery, one of Uganda’s most reputable exhibition platforms, owing to its historical import and also being the arm of the Makerere art school, Uganda’s premier art training institution. Whether the duo was selected to exhibit in order of importance and/or achievement or simply because they were ready before others may be besides the point. What is clear is that this season marks a very important period in the history of the gallery and as such we must assume that whoever is selected to showcase there should be of a certain aesthetic and/or historic derivation that is above average. Looking at the artistic expression and background of the duo, we get a sense of the mannerism upon which their individual styles are founded. Daudi Karungi has been described by the Makerere Art Gallery sources as a multi-talented and intriguing artist who is also a gallery owner and always keen to push and transcend the boundaries of traditional visual arts. Henry Mzili Mujunga, on the other hand, is—according to the same sources—a dedicated painter who works in long-term projects deeply exploring specific subjects. Besides, he is an art teacher and critic. 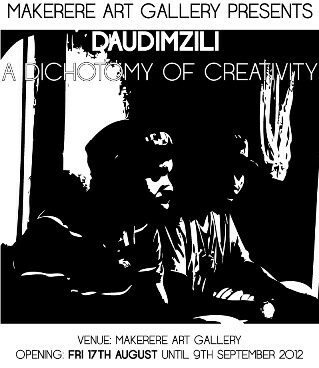 Apart from Daudi being a proprietor of a gallery and Mzili being an art critic, the duo is virtually bred and raised by the same parents of modern visual training and groomed by similar platforms of exhibition. However, getting down to analyse the dichotomy, or, simply put, the seemingly contradictory qualities of the two artists, it is necessary to take a deeper gaze at their individual styles and how they eventually tie into the theme of indigenous expressionism that they suggest that their works illustrate. 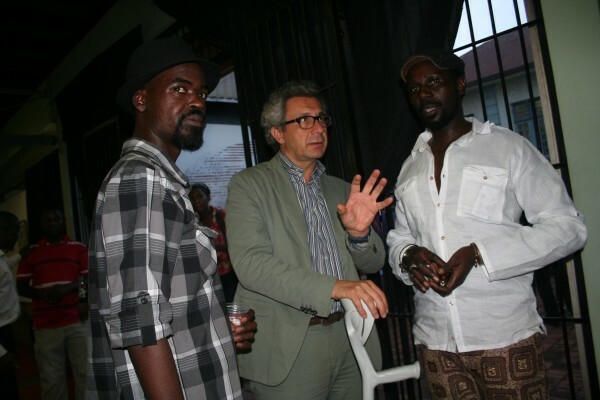 Ugandan visual artists Daudi Karungi (left) and Henry Mzili Mujunga (right). Putting aside the flowery descriptions of the project, what Mzili wishes to refer to as ‘Indigenous Expressionists Creed’ (a phrase assumedly coined by the duo), we critically begin to scruple in hesitation about the connection between the works and the indigenous expression as we all know or understand it. Collectively, Daudi and Mzili appear to, consciously or unconsciously attempt to instigate an ‘anti-mainstreamist’ (my term) crusade that seeks to topple further the limits of modern art expression. However, their biggest downer, in my opinion, remains the glaring fact that a further probe into the nature of their works reveals the contrary; their rendering in extremely modern techniques of picture construction contradicts the so-called native traits. Daudi essentially plays around with the human figure in varying shades of abstraction—from the restrained to the extreme. However, there is minimum or no indication whatsoever that the figures suggest indigenous people. From the exhibition at Makerere. 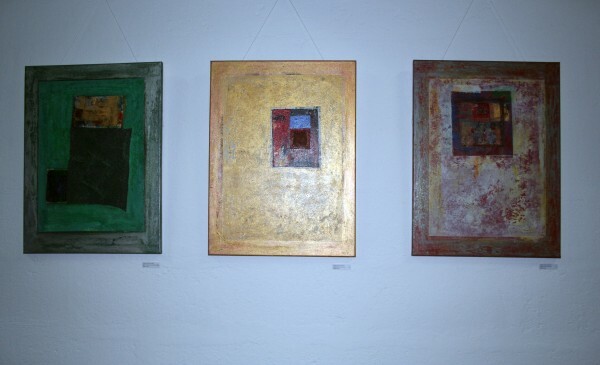 Artworks by Daudi Karungi. On the other hand, Mzili takes the technique of abstraction to the hilt by exploring themes that suggest a non-representational approach; no human figures or recognizable forms that can be seen in the natural world. Perhaps they imply the Ganda spiritual rendering that he suggests in his own words. Of course, well knowing that to paint a spirit medium is an impossible task, seeing that a spiritual is devoid of a tangible form, Mzili is probably justified to configure his works that way. If this is where the indigenousness of their creativity connects, then it gives us another food for thought. From the exhibition at Makerere. Artworks by Henry Mzili Mujunga. Inside or outside the box? Daudi and Mzili hinted in a joint statement that their show is a demonstration of the fact that one can still work within the box and achieve startling results. To a creative artist the box is not yet fully explored. This statement contradicts the popular cliché that people learn to think or work outside the box, which implies working outside conventional establishments. In which case the two suggest that convention has not yet been fully exploited and thus it is not always necessary to seek the unconventional. This is granted, given the well-known short history of the two artists and their penchant for the weirdo. In fact, the string that has usually tied the two together has always been the idea of courting controversy. They seem to suffer an unquenchable predilection for sailing on deserted or unwanted paths that will lead to their desired destination called controversy. This they have demonstrated in the countless exhibitions and project they have held over the years. From the exhibition at the Makerere Art Gallery. 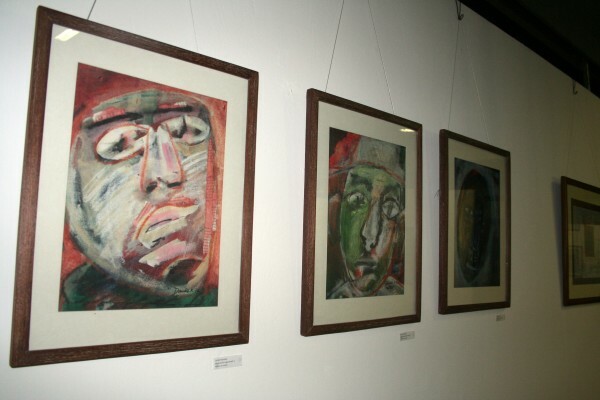 Artworks by Daudi Karungi (left) and Henry Mzili Mujunga (right). Moreover, we are aware that stylistic approaches to Modern or post-Modern art have become increasingly blurred for anyone to make or add any meaningful twists that will spur real challenge to the current trends. Thus, the twin painting exhibition of DaudiMzili may ostensibly be called a dichotomy of creativity but in reality it smacks of an irrational semantic inconsistency—in lack of a better phrase. Among the questions that could remain long after the exhibition concludes include: What really is indigenous about the Daudimzili show? And what is dichotomous about their creativity? If these questions remain rhetoric in nature forever, then some observers might as well be tempted to construe the duo as indeed a paradox of mutual confusion. Nathan Kiwere is the President of the Uganda Visual Artists and Designers Association. Images by courtesy of the artists. You use ” archetypal artistic bedfellows. They seem to have suckled from the same breast of contemporary art awareness and their styles are scarcely singular” and this to me seems like Daudis personality than what he exhibited! If i compare the abstract of paintings of Banadda Godfrey and this art work… am shock of words! I think we need more detail to this creativity…and i can individually single out why i write this to the paintings above but david..i have followed your work but this needed some detail! Agnes, i meant to comment on Nathan’s critique later but reading your comment i have to ask you to visit the exhibition again, read the information about the show, look at the works again, read about creativity and last but not least try to research about the concept of less is more. And Banadda?? seriously??? in comparison?? Its like apples and oranges. The idea of the show was to explore methods that are still within the contemporary box. Nathan, i will comment on your critique, soon. I am happy to make some humble contributions to arts journalism and i am looking forward to further discussion on this piece and, perhaps, some criticism on my approach. Nathan, Let me start by thanking you for a most comprehensive reportage on the exhibition. This is your opinion and I don’t think you are wrong in saying what you did. Agnes, I feel that your comments are coming from a place of frustration. Artists are not bound by their audiences demands. Quite the contrary actually. By moving past the attachment to audience whims and desires, the artist is release to access that place inside that makes them what they are. The mind of the artist is a scary place and sometimes, what may seem like less truly is a treasure trove of beautiful ideas.